Lucille offers a traditional styled swivel chair with a contemporary twist perfect for any home or room. 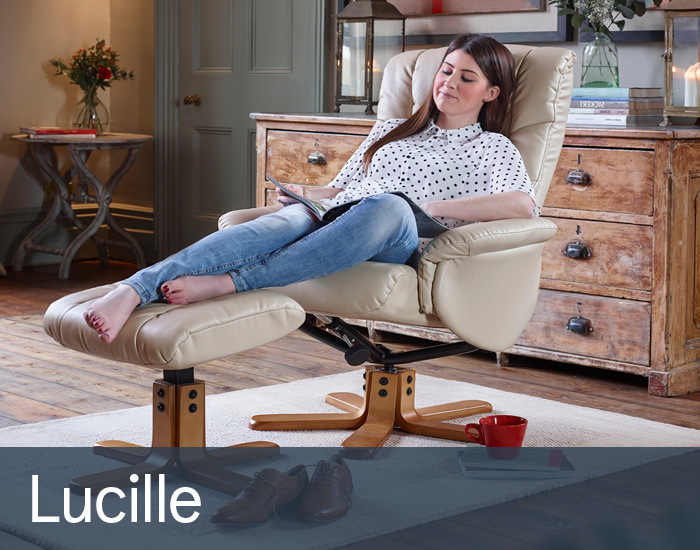 Boasting a 360 degree swivel action and lockable reclining position, Lucille strives to provide the utmost in support and practicality. Upholstered in bonded leather across the seats and backs provide the chair with a neat, available in several natural colours to suit any decor. Crafted from a durable solid wood frame, the star shaped quirky base with black studded detailing in a warm cherry finish, gives the chair a little character to add to the room. Sumptuously padded foam with fibre wrap seats provide the utmost in support and comfort, aided with the integral head and lumbar support features and the complimentary footstool for a harmonious fusion while relaxing. Further aided by the lockable reclining action, helps you to find the ideal seating position to help relieve aches and pains.